Basil (Ocimum basilicum L. and its varieties) is a popular herb known for its flavorful leaves. The fresh or dried leaves add a distinctive flavor to many foods, including Italian-style tomato sauces, pesto sauce, and salad dressing. The essential oils and oleoresins may be extracted from leaves andflowers and used for flavoring in liqueurs and for fragrance in perfumes and soaps. Scented basils, such as lemon and cinnamon basil, are used fresh or dried in potpourri, jellies, honeys, vinegars, and baked goods. While many types of basil are available (Table 1), sweet basil is the culinary classic. This publication specifically discusses fresh-market basil, examining the selection, production, harvesting, and marketing of the product. Table 1. Common basil varieties for fresh and dried production. Sweet basil Ocimum basilicum Oval, 2-3" long, smooth, bright green Most common, used fresh and dried. To ensure a good crop, obtain high-quality basil seed. Select a variety that will produce a good flavor and attractive, dark green or purple foliage. A common problem with many herbs is the extreme variability within a seed lot. 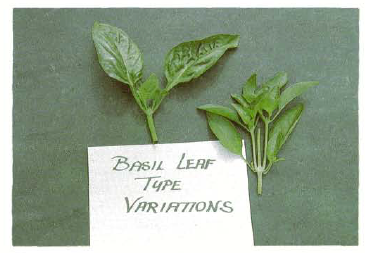 Many leaf types can come from one package of basil seed (Figure 1). Only one or two of the leaf types, however, may be marketable. Germination percentages will also purchase your seed from a reputable source. Quality, trueness to type, high germination percentage, and reliability are much more important than price. Basil is a tender annual, easy to grow but very susceptible to cold weather. Row covers may prevent frost damage, although they are not always practical or cost effective. For best results, plant basil in late spring after all danger of frost is past. Choose a sunny location with well-drained soil. A light sand loam or silt loam with a pH of 6.4 is preferred. It is best to obtain a complete soil test before planting. See your county Cooperative Extension agent for details. Basil can be grown from seed or transplants. For a direct-seeded crop, sow seed thinly (8 to 10 seeds per inch) in a well-prepared seedbed. To prevent the soil from crusting, cover with a fine layer of soil (approximately 1⁄8 inch) mixed with vermiculite or peat, and keep the soil surface moist. Plants will emerge within two weeks. For all growers in western North Carolina and for any grower who wants an early crop, seedlings should be started indoors and then transplanted into the field. Basil seedlings are easy to produce in a greenhouse. In April or May, sow seeds in trays or flats filled with a well-drained, soilless potting medium. The seedlings will be ready to plant in the fields five to six weeks later. Before planting, trim the plants to encourage branching, harden them off, and then plant them into the field when they reach 6 inches in height. See Cooperative Extension publication AG 337, Production of Commercial Vegetable Transplants, for further information. Basil should be produced on raised beds because these beds warm quickly in the spring and promote good drainage. Spacing between beds or rows should be determined by the dimensions of the equipment that will be used for cultivation throughout the season. The most common row spacing is 2 to 3 feet. Double rows about 12 inches apart with plants spaced 6 to 8 inches within the row produce the highest yields. Producers with large acreages plant 30,000 to 35,000 plants per acre. Mulch is recommended for basil production because it retains soil moisture, prevents weed growth, and keeps the foliage clean from soil. The most commonly used mulch is black plastic, which encourages an early first harvest by warming the soil in the spring (Figure 2). An organic mulch, such as hay or straw, can also be used and will help increase the organic matter in the soil when it is incorporated in the fall (Figure 3). Be sure to use high-quality hay or clean straw to prevent weed problems from seeds hidden in the mulches. Avoid wood mulches such as bark, chips, and sawdust, as recent research has shown that they can reduce yield substantially. Although specific recommendations are not available for basil, following the guidelines for salad greens usually produces good results. Generally, incorporate 75 to 100 pounds each of nitrogen, phosphate, and potash per acre at planting. Sidedress or apply through drip irrigation-an additional 15 to 20 pounds of nitrogen two or three times during the growing season. Fertilizers suitable for drip irrigation application include 20-20-20, 15-0-14, calcium nitrate, or potassium nitrate. Do not overfertilize basil or flavor will be sacrificed for growth. Basil cannot tolerate drouth stress. To maintain constant growth throughout the growing season, water regularly. Although basil can be irrigated with a simple overhead sprinkler system, drip irrigation is best. Plants grown with drip irrigation are less likely to develop foliar diseases than sprinkleirrigated plants because the foliage stays drier. Research has shown that growing basil with drip irrigation and black plastic mulch results in high yields of high-quality, clean leaves. Figure 1. Two sweet basil leaf types produced out Of the same package of seeds. The leaf on the left is large, soft, and slightly puckered. The leaf on the right is smaller, more elongated, thicker, and smoother. Figure 2. Sweet basil and bush basil grown on black plastic mulch with drip irrigation. Figure 3. Bush basil grown with straw mulch. Currently, no herbicides have been approved for use on freshmarket basil. Weed control is critical, however, because competition with weeds decreases the quality of fresh basil leaves. To keep weed populations- low, use high populations of basil plants, shallow cultivation, or mulch. There are also no specific pesticides registered for basil. Preventing diseases through good cultural practices is the most effective way to produce a healthy crop. To prevent foliar diseases, keep the foliage as dry as possible by watering early in the day or by using drip irrigation. 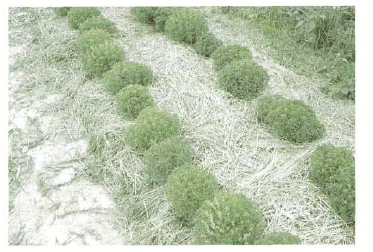 To reduce soil-borne diseases, rotate herbs to different parts of the field each year, and remove and destroy all plant debris after final harvest. B.T. 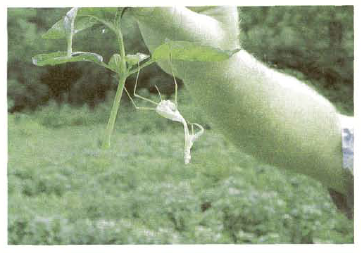 (Bacillus thuringiensis) products are the only insecticid registered for use on basil in North Carolina. They are biological control agents that kill a variety of caterpillars. If insect problems become serious, other organic methods may be tried. 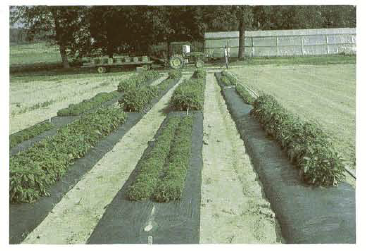 Reflective mulches, beneficial insects, traps, and hand picking will help control some insects (Figure 4). Japanese beetles are particularly detrimental to the basil crop. Japanese beetle traps placed just outside the field are fairly effective. Because Japanese beetles prefer Pennsylvania smartweed to basil, another strategy that is often effective is to border the field with smartweed as a trap crop. Figure 4. The remnants of a molted exoskeleton of a praying mantis, a beneficial insect that feeds on other insects. For fresh-market production, with double rows and plants spaced 6 to 12 inches apart, expect yields of 125 to 250 pounds per hundred feet of row over a nine-week harvest period. Single rows reduce yields to between 75 and 100 pounds per hundred feet of row over the same period. Foliage may be harvested whenever the plants are large enough that four sets of true leaves can be left to initiate further growth. The foliage must be harvested before the plants bloom. Small-scale, fresh-market producers can either cut or pinch off the terminal 2- to 3-inch whorls of leaves on each stem or cut bunches of stems about 6 inches long. For largescale production, use a sickle bar mower with adjustable cutting height. For a high-quality product with long storage life, harvest basil when the foliage is dry and cool. In the early morning the foliage is cool but often wet with dew. In western North Carolina, many growers find that the best time to havest is late afternoon. The basil must be cooled quickly to remove field heat. Large ice chests can hold the harvested foliage until it can be removed from the field. After harvest, remove any weeds and wash leaves, if necessary. One of the advantages of using mulch is that the leaves usually do not need to be washed. If they must be washed, be sure to dry the foliage thoroughly or it will deteriorate quickly in storage. Only the highest quality basil with the best color and aroma should be used for fresh-market sales. Refrigerate the leaves as soon as possible. Optimum storage temperature is 40 to 45°F; lower temperatures may cause discoloration and deterioration. For bulk sales of fresh basil, leaves can be loosely packed into perforated or food-grade, gas-permeable plastic bags. Pack 1⁄2 to 1 pound of leaves per bag. For retail sales, small, uniform bunches of leaves can be tied and packaged into small plastic bags or sleeves. Either way, the bags should then be packed into clean, sturdy boxes to prevent crushing. A common complaint about small-scale herb producers is that they often package their product in a way that makes it difficult to handle with other produce. Herbs packaged in standard-size boxes can be stacked and moved around easier and with far less damage than herbs packaged only in plastic bags. Excess basil leaves with some damage can be dried. Spread cleaned leaves loosely on screens and dry them in a forced-air drier set no higher than 120°F. Some growers start with an initial heat of 85 to 95°F and increase the temperature gradually as the leaves dry. Slow drying produces leaves with good color and high oil content. Basil that is dried quickly at high heat with poor airflow will turn brown and flavorless. Dried leaves should be stored in the dark in airtight containers such as glass jars or heavyweight, tightly sealed plastic bags. As with any agricultural product,. markets should be established before production begins. For small, freshmarket sales, local restaurants, health food stores, and gourmet groceries may be ideal outlets. Farmers' markets, tailgate markets, and roadside stands are other possibilities, though keeping the basil cool and fresh may take some special planning. Many small-scale herb growers make value-added products such as pesto, basil vinegar, fancy-packed dried basil, and basil cookies. These products can be sold on consignment in specialty shops. For larger scale production, check specialty produce wholesalers and brokers; supermarkets; and institutions such as hospitals, schools, and military bases. When approaching the buyer, take a sample of the basil in the package that you intend to deliver. If working with restaurants, it may help to leave a sample and a few recipes for the chef. Be sure to discuss and agree on quality, quantity, packaging, delivery times, and payment terms.